Dyseriocrania subpurpurella, photographed by Sander van der Molen. 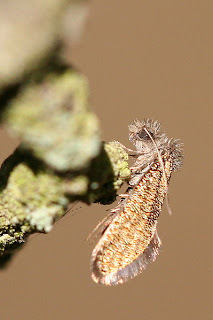 The Glossata is the clade of Lepidoptera in which the mouthparts have become modified into a long coiled proboscis (though this has been lost in various subgroups). Basal lineages of the Glossata are mostly leaf-miners as larvae (Grimaldi & Engel 2005). Synapomorphies (from Grimaldi & Engel 2005): Nonfunctional or vestigial adult mandibles, lacinia reduced; galeae long, concave and zippped together with rows of minute processes (legulae) to form a proboscis that is usually coiled at rest; larva with a spinneret on apex of prelabial-hypopharyngeal lobe.